CHINA & CHINESE TAIPEI: Here is a number of recent agriculture and seed industry news highlights in China and Chinese Taipei (Taiwan), including specialty soybeans, maximum residue limits for produce; organic rice; banned GM lunches; roller coaster cabbage lessons and potential allergies linked to non-browning apples. Anticipating China’s soybean demand to outstrip anticipated domestic production of about 11.6 metric million tonnes by 20% this year, the US Soybean Export Council has put in much effort to convince China that US soybean suppliers can meet China’s strict requirements for quality, non-GMO produce. To cover its demand last year, China imported most of its specialty soybeans (non-GMO) from Russia and Canada. China has increased the number of Maximum Residue Limit requirements (MRLs) governing pesticide traces on commercially-traded produce. Promulgated last month, the 2016 National Food Safety Standards on for Pesticides in Foods regulation now specifies 4140 MRLs for 433 pesticides in 13 categories of agricultural products, an increase of 490 MRLS when compared with the 2014 version. The regulation covers almost all kinds of commonly-used pesticides and major agricultural products, (MRLs). According to an announcement, the new version of the regulation has set 184 MRLs for 24 banned or restricted pesticides, including Fenamiphos; exempts MRLs for 33 pesticides that pose no dietary risks in line with international practices; and recommends testing techniques for MRLs, providing national standards covering 106 MRLs. Through to 2020, China aims to develop 6,000 new MRLS, mostly for vegetables, fruit and farm products, while gradually implementing limits on imported food. China has agreed to import 20,000 tons of organic rice from Laos. Xinhua reports that the Lao Prime Minister Thongloun Sisoulith had recently revealed the good news to local officials in the southern Lao province of Champassak. According to the agreement, Laos will need to deliver 20,000 tons of genuine organic rice to China. The shipment may be screened to ensure that it does not contain any non-organic rice. About 4,000 tons of sticky rice and non-glutinous rice had already been delivered to China following an earlier agreement to export 8,000 tons of Lao rice to China. China has approved an increase from 8,000 tons to 20,000 tons. The rice is being grown in Savannakhet province and Champassak province’s Khong district. According to Lao Ministry of Agriculture and Forestry in October, only the IDP Rice Mill in Savannakhet province was able to produce quality rice meeting the standard required by Chinese buyers. During the wet season in Laos, rice is cultivated on more than 778,000 hectares, while dry season rice is planted on about 126,600 hectares, with an estimated 226,000 hectares of rice fields dependent on rain. Since 2000, Laos has exported over 300,000 tons of rice annually to Vietnam, Thailand, China and other countries. 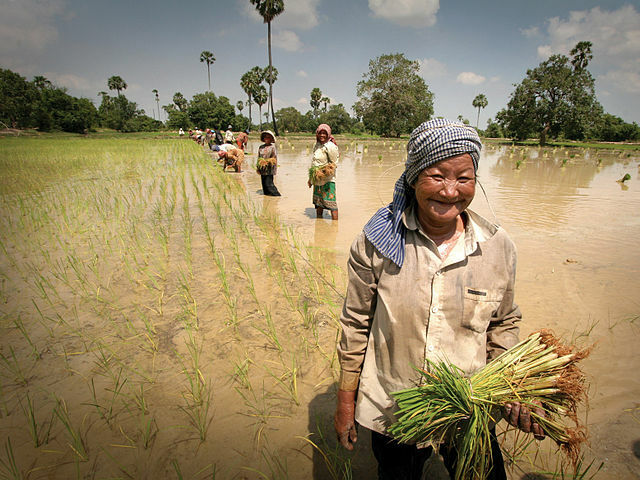 Laos is expected to produce about 5 million tons of rice by 2020 to ensure food security in the country. In the 2015-2016 fiscal year, Laos’ rice production reached 4.12 million tons and is predicted to increase to 4.35 million tons in the 2016-2017 fiscal year. At the end of last year, Taiwanese legislators formally amended the School Health Act , effectively prohibiting both raw and processed GM ingredients in school lunches. The new regulation, which is estimated to increase the cost of each meal by $0.15, is set to be enforced at schools this year. The ingredient in Taiwanese food most likely to be GM is soy, with the country estimated to consume 7.2 million bushels of GM soy, mostly imported from the US, out of 8 million bushels consumed overall annually. When late-season typhoons and unusually warm weather in September and October last year contributed to a shortage of cabbages in Taiwan, prices skyrocketed to as much as NT$300 ($9.50) per head, compared to only NT$40 ($1.27) previously. After the country began to grow and import more cabbages to compensate, the market then experienced a glut late in the year that saw prices stoop down to as little as NT$10 ($0.32) per head. Toxicology researcher Lin Chung-yin at the Chang Gung Memorial Hospital in Linkou has expressed concerns that non-browning GMO apples may pose health threat to infants, children under 12, pregnant women, senior citizens and others suffering from chronic illnesses. The apples in question, which have yet to be imported into Taiwan, have been modified to have lower levels of polyphenol oxidase, which is what causes the fruit to turn brown upon oxidation.